Well I've been all around the houses with this. None of the fabrics I showed in my last post felt absolutely, definitely, no doubt about it right. So I went back to my boxes and tried almost everything. I tried solids, big pattern, small pattern. I tried variations on blue, yellow and brown again. Then I tried green, then grey, then pink, purple, red. I tried pretty much everything. This was the one I liked the best. But when I spread the fabric out and tried it over a bigger area, I liked it less. Humph. Yesterday the boxes came out again. I considered a dark grey, an old Carolyn Friedlander with gold triangles. Both had their merits but neither ticked all my boxes. Then I had a moment of insight (yes, it happens from time to time). When I started this project my note to self read 'not literal, just a design prompt: lines, shapes, repeats, spaces'. Yet here I was, thinking literally: these spaces needed to be a different fabric because they were 'roads' not 'alleyways' or 'walls'. But this is a quilt not a map. So I tried this. Much better. Onwards and upwards! The stripe is awesome. Some things need a bit of time to simmer! Yes, those 'aha' moments. Relief. And the stripes fit right into your plan. I am glad the solution finally came to light. So funny how quilts seem to tell us what they want. 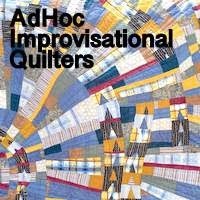 Some quilts are quite insistent and others wait for us to figure it out. I'm glad you're satisfied. That's what is important. Cool, this looks really great and I loved reading about your thought process. Yup! I like it. Sometimes we think too hard! I just love those birch trees!! Bingo! You did it. Carry on MacDuff! I'm finding lately that I want/need more white (or white prints) in my work lately. While I love all the other fabrics and hope to see them make it into the quilt somewhere, this lighter, repeated fabric makes a wonderful change. My other suggestion would have been to change the fabrics from time to time like old world maps changed country or county colors. I've read we only need five. Ah, there's an idea. Finally, thanks for the reminder that it doesn't have to be literal. Mine still is but that's where I start. It takes me a long time to abstract anything and it's still more a code. Ha! I knew this was your post as soon as I saw the photo in Bloglovin, I didn't need to see the byline. I love it. I love the light stripe. Maybe because I see roads all over the quilt already? Wise words from you Kaja stating 'this is a quilt not a map'. I admire your patience in trying new settings and moving the sets around until you're perfectly happy with it, adding here and there to see how it all fits. And just like that, you've got another winner!